A drawerful of beautiful memories! Thannks Liz. 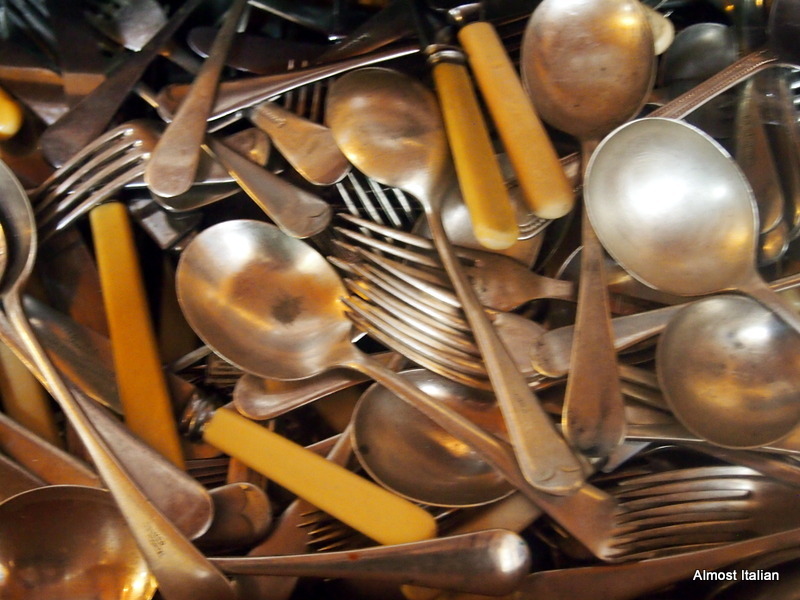 It is surprising how many stories go with old cutlery. If you mention bone handled knives to people, they will tell you a story. Rummaging is what is required. It’s full and deep. Thanks Kylie- if only they coild tell us their tales. Beautiful photograph! You can almost feel the patina of age on the flatware and cutlery. Those jumbled layers seem like a metaphor for the collection of memories and stories they embody. Just out of curiosity, any of them marked with a Sheffield stamp? Ah Deb, you write so well. It is true- they are indeed a metaphor for a colllection of so many stories. I found all these knives and forks in ‘refugee centres’, donation centres which were set up in old church halls around our area after the 2009 bushfires. As I had nothing at all, I began my life again at these centres. Most of the found items were functional things- but I couldn’t resist these and began rummaging around cutlery boxes for them. This is partly why they are so important and make me happy. I did have a similar drawer before the fire. When I return form wandering around Asia, I’ll check the stamps on them. I am sure many would come from Sheffiled. Do you collect Sheffiled cutlery? I live in Sheffield and am surrounded by archaeologists and historians who know of the city’s history in metal working. In the 19th century Sheffield flatware (that is, non-knives) and cutlery (things that “cut”) are said to have been sent everywhere around the world, just as the British themselves in establishing colonies and building an empire. The museum here has a good display of various types of things Sheffield industries produced. They still make some things – knives in particular – and a few factories have become quite chic – like David Mellor who produces award winning designs. Did you loose everything in a bush fire? Such devastation. I can’t image what that must have been like. As long as it was only things that were lost. Memories are all the more precious. One of my ancestors came from Sheffield. I have always associated ‘flatware’ with Sheffield, when knives and forks such as these were commonplace in our suburban 1950s home. Yes, I lost everything, a lifetime of travel memorabilia from around the world, books, academic documents. children’s photos, aboriginal paintings from noted artists,walls of art and antiques, collected Chinese Buddhas from my husband’s work there where he lectured off and on, antique Tibetan Tankas, collected weaving from Indonesian islands … I should just stop at this point. All just things. We know about non- attachment, but it is hard to lose your own history and I am still struggling with ‘renewal’. Mostly I am enormously grateful to Australians for their generosity, which enabled me to begin again- quickly. See my Feb In My Kitchen post on this topic. I can’t imagine what it must be like to lose a lifetime of memories. But a drawer full of nostalgia and solid old things must be reassuring. Happy travels for the rest of your trip. Thanks Nancy, I love that drawer. I thought of you as I was travelling through Szechuan, without google access. A VPN is a girl’s best friend in China what can I say? We are going to Chengdu for Christmas so I might have to pick your brains about what you got up to. It is a beautiful photo of the drawer and all the more beautiful for reading your comments about finding this cutlery – I have a fondness for this old cutlery but I sometimes think of my mother saying you give your enemies silver – I still remember sitting down with her as a child to polish the silver – alas mine probably needs a little more attention than I give it and my old cutlery gets jumbled up with cheap modern stuff – but at least we enjoy using it. Its lovely to use Johanna, and really worth separating from the ordinary stuff. I sometimes get a soft soap jex and pop them all in the sink. They love soft jex. especially the Tablespoons, which live in a separate container near the stove and I only use these babies for cooking. I am sure there would be some magical fix with bi-carb and vinegar, but I am sticking to Jex. Think big soups and old silver spoons! Oh how I love bone handled cutlery! They too remind me of my childhood and my gran and grandad’s home and Sunday lunches. Hi Celia, although away, I really couldn’t miss a month and so I was quite surprised to find a pic of my cutlery drawer in the hard drive of my old notebook travel computer, which is an annoying little thing at times. I don’t polish them but sometimes I get a set at a time and give them a doing over with a soft soapy jex. They love this. I also have a big set of tablespoons which sit by the stove for stirring and so on. These get a jex workover more often. Someone told me about a sink of hot water, bi-carb soda and tinfoil. It wasn’t as good as the soft jex. I use the big soup spoons often- for Italian soups and serving risotto. I am still on the lookout for large soup spoons- the modern stainless steel ones look ‘sad’ by contrast. Yes, Mary, old kitchenalia and a few old recipes make a good kitchen. I love antique cutlery too and recently acquired a few pieces from a friend… My Nana started this passion when she passed on her collection to me! They are so nice to use on special occasions and we always think of our Nanas. 🙂 I miss my nana almost every day! I completely agree about a drawer filled with silverware. Wonderful. A memory drawer- that’s what I will call from now on. Thanks Tandy. I love your post Francesca. Though I am a massive fan of deep bowled soup spoons, the thing I really love is that you have introduced me to a new word. And I love words. ‘Quotidian’. It rolls off the tongue nicely and I shall be trying it out in sentences today, even if I need to engineer the opportunity. Thanks. Oh that’s wonderful. I use it all the time in Italian- quotidiano- where it is really commonplace and ordinary. As I am in Indonesia, I am unable to comment on any IMK posts that use a sign in process through blogger or blogspot, so forgive me if you are one- I’ll catch up on my return. Francesca, I loved your phrase “simultaneously happy & nostalgic.” Yes, antique cutlery has a ‘story’ behind it, and your dresser drawer looks chock full of stories! G’day! Love kauri pin and nostalgia! Francesca – I hope you are having a wonderful time!! Love the cutlery – thanks for posting!! Wow I bit every piece could tell a great story. I am new to IMK so my post is a bit late. Is it up now if you would like to read it. Emma.